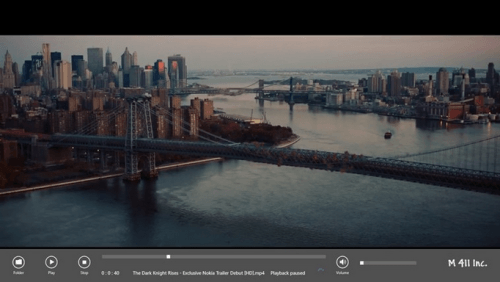 Play Me is a nice and simple free Windows 8 video player app. Its allows you to play multimedia files in MP3, AVI, MP4, XVID, and WMV formats. The easy to use interface works best on both touch and mouse. Use it to play videos or just for listening music. The size of Play Me Windows 8 app is only 60 KB. To know more about Play Me Media Player you can click here. Metro Media Player for Windows 8 supports Playback of MP4, WMV, MP3 and WAV file formats. The significant features of this Windows 8 media player applications is that it can play online content as well. On touch-enabled devices you can use the swipe gesture for adjusting playback speed. Alternately, you can drag mouse horizontally for the same purpose. To know more about Metro Media Player For Windows 8 you can click here. Zeal Video Player is another nice free Windows 8 App for playing WMV and MP4 files. This is a really simple video player with option to rewind and fast-forward the video being played. It also support playing videos in full screen Mode. To know more about Zeal Video Player you can click here. The features of Pyro Media Player are very similar to that of Zeal video player i.e. you can play, pause, forward, rewind, and view video in full screen. The interface is really simple with zero hassles. It can also play Mp3 files. To know more about Pyro Media Player For Windows 8 you can click here. Here comes the end to this post on 4 Free Lightweight Windows 8 Video Player Apps. Each one is quite stable and capable to play common media formats. The only issue is that you won’t be able to play files in other media formats.